Insects sometimes cause massive damage to landscape plants, but these instances are usually rare occurrences. It's only when the insect populations reach a certain critical mass that the damage becomes troublesome. 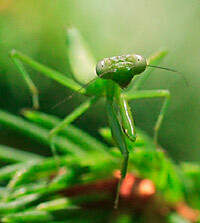 Most insects pose no problems at all to lawn and landscape plantings. Often, many insects are predators of other insects that are harmful. Therefore, we need to be very careful about using insecticides that will kill all the insects in a given area. For the most part, you can ignore most insects in the landscape. There are some exceptions: particular attention should be given to Japanese beetles (steps should be taken as soon as they appear in the landscape). Plants damaged by the majority of insects include leaf problems. Identifying the type of leaf problems you have will help in identifying the particular insect that is causing the damage. The following are a grouping of types of insects associated with particular leaf problems. This list is by no means exhaustive, but tries to give the reader an insight into some of the more common insect problems. Asparagus beetles asparagus leaves are eaten, the epidermis is removed from stems causing the upper growth to dry and turn brown. Black vine weevils yews, rhododendrons, hydrangeas, euonymus, camellias, grapes, strawberries and fuchsias notches appear in leaf margins, often near the ground from late spring to mid fall. Colorado potato beetles potatoes, tomatoes, eggplants, peppers leaves are eaten, leaving only the main vein. 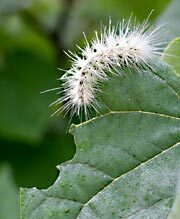 Gypsy moths many deciduous trees and shrubs, but especially apples, hawthorns, oaks, lindens and sometimes conifers such as spruce leaves are eaten and plants may be defoliated. Repeated attacks will kill the plant. Japanese beetles various plants including grape, roses, and daylilies flowers and leaves are eaten often in groups, leaving only the veins of the leaf visible. Insects are not a common cause of residential lawn damage, but certain insect species occasionally damage or kill turfgrass. Insect feeding can cause grass to turn yellow or brown, or die, especially if the grass is already stressed. Damage usually begins in scattered small patches, which may merge into large dead areas. Lack of proper cultural care and use of inappropriate grass species in a particular location are more likely responsible for unhealthy or dying lawns than insects. Disease-causing pathogens, excessive or inappropriate use of chemicals such as fertilizers and herbicides, and dog urine also produce damage resembling that of insects. Before taking any insect control action, be sure that it is insects causing the problem and not something else. Insects that do infest home lawns are often difficult to observe and their presence goes undetected until significant damage has been done. Plus, insect damage can be mistaken for other problems such as drought damage. If the lawn remains brown or shows signs of thinning despite appropriate watering, then closer examination for insects should be done. A lawn inspection should include looking at leaves, stems, roots, thatch and the soil to determine if the problem is insect-related and catch the problem before extensive damage occurs. Insects that may cause damage lawns include various root-, crown-, and leaf-feeding caterpillars; white grubs, which are the larvae of beetles; billbugs, which are weevils with white, grub like larvae; and chinch bugs, which are true bugs in the order Hemiptera. Armyworms, cutworms, mole crickets also cause damage to lawns. In northwestern America, crane flies are sometimes a problem. Each species produces somewhat different damage symptoms and must be managed differently. Many insects may be observed while examining grass. However, control is rarely or never needed for most types of insects because they are harmless, and more likely to be beneficial. Common beneficial insects include predatory ants, ground beetles, rove beetles, and blister beetles. Other common arthropods that are primarily decomposers and do no significant injury to turfgrass include springtail's and millipedes. Good cultural practices are the primary method for managing insect damage to lawns. Growing appropriate grass species for a particular location and providing lawns with proper care are especially important. Practices such as irrigating and fertilizing have a major impact on lawn health. Physical controls, such as thatch removal, choice of mowing height and frequency, and providing grass with more light by pruning tree branches, are also important in certain situations. Most home lawns do not need to be treated with insecticides if proper cultural practices are followed. Insecticides should never be applied unless a pest is identified and detected at damaging levels. If insecticides are necessary, choose materials that have minimum impacts on beneficial organisms and the environment. Keeping your grass healthy is by far the best way to prevent damage from lawn pests. 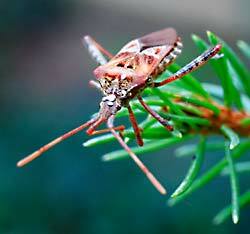 Healthy lawns require few, if any, insecticide treatments. If a lawn is under stress and a pesticide is applied, it stands a better chance of suffering damage from the pesticide itself.